Since ­mid-­August, Iceland’s Bardarbunga volcano has experienced more than a thousand earthquakes and two eruptions, with spectacular arrays of lava spraying and flowing from fissures around the caldera. Researchers studying the volcano’s seismic activity have been in the field since the beginning, recording the propagation of a dike, which serves as the conduit for the magma that feeds the eruptions. 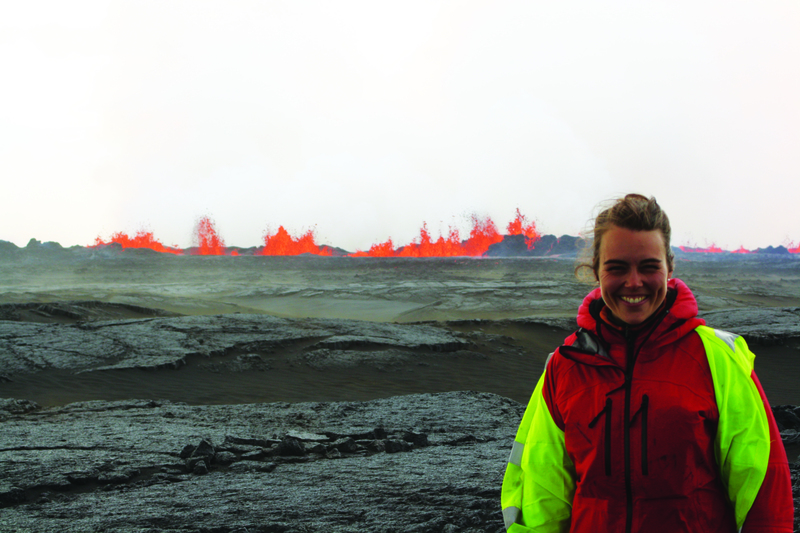 Thorbjorg Agustsdottir, a Ph.D. student at the University of Cambridge, is one of the researchers studying the Bardarbunga volcano’s ongoing seismic activity and eruptions. Her research group, led by Robert White, spent August servicing seismometers all around the volcano to make sure they work properly; during the eruption, Agustsdottir came within 100 feet of flowing lava. Eos was able to speak with Agustsdottir while she was in the field about what it’s like to live and work so close to an erupting volcano. Eos: Where were you when the eruption started? Agustsdottir: I was already in the field, servicing our seismic network in Askja, which is an adjacent volcanic system to Bardarbunga. We always service it at this time of year. Due to the activity in Bardarbunga, we were also installing more stations in the direction of the dike. We got a call just after midnight on 29 August because we were the only people in the area. When the first eruption started, I was actually in bed in a mountain hut some 30 kilometers away. We got woken up by our special safety radios and were asked to verify if there was actually an eruption starting. The Iceland Meteorological Office [IMO] could see some activity from Reykjavik, but they wanted us to confirm what the glow was on one of the monitoring webcams. They wanted to know if this was an eruption or an illusion. My group was the first on site along with two technicians from the University of Iceland’s Institute of Earth Sciences and a scientist from the IMO. We were the first to see the eruption and to see the second eruption on 31 August as well. Then a group of geologists from the University of Iceland arrived to study the erupted materials from the first one. Within that first week before the eruption started, we felt intense earthquake activity. Also, the dike propagated closer and closer to where we were staying. So we weren’t sure what was going to happen, because the dike seemed to be headed towards Askja, which is also an active volcano. To me, in the middle of things, it felt a little surreal that we were even having an eruption in our network on top of the dike intrusion. We are really lucky because we have so many seismic instruments in the area. We will have one of the best monitored dike intrusions and two eruptions in our data set. Eos: What were the eruptions like? Agustsdottir: The first eruption on 29 August was like a small burst. The second one started on 31 August and is still ongoing (as of 22 September), so we drove there to check it out. We were fairly close; first we were maybe about 500 meters away. Then we had to go closer during the second eruption to save our instruments. We were only a few tens of meters away. It was very exciting. You always have to stay far away from the lava fountain because they’re extremely dangerous. You have to be well aware of the lava since it is flowing. So you have to stay on your toes, but we have always had safety as the highest priority: The cars are running all the time; there are always two cars working together; there are gas meters in the cars. We also regularly check with the Icelandic Civil Defense and others who are managing the area. We have to let them know once we are within a certain distance from the eruption site, and they track us. You feel very safe, like someone is watching you. But you’re still there at your own risk. Eos: What is it like to see an erupting volcano? Agustsdottir: It is amazing to see an eruption! The force, the sounds, the smell is overwhelming. Spectacular! It can be cold and rainy in the field, but this time we’ve been lucky with good weather. It is incredibly hot close to the lava. We have to dress well and be prepared for sharp weather changes. The eruption is taking place on a flood plain, so it can get quite dusty. If it’s windy, the dust is blowing everywhere. When the second eruption first started, we had to retreat due to a sandstorm. The instruments need power, so we built solar panels to sustain heavy winds and snow. The heavy winds can blow them over, so we have to weigh them down with big rocks, but the instruments themselves are underground. Eos: Have you gotten close to the action? Agustsdottir: We had to go quite close to the lava to rescue some seismometer stations. For the last station we pulled up and moved on 4 September, we were less than 30 meters away from the lava. The day before, two field technicians from the University of Iceland pulled up a station much closer. We have felt safe in the field; of course, we’ve been a bit nervous, but everything has been fine. Eos: Who’s out there? How are they managing? Agustsdottir: Professor Bob White of the University of Cambridge and his team. I am one of his Ph.D. students. White has been expanding the seismometer network since 2006, from Askja to all around Vatnajokull. We expanded the network to encircle the whole Vatnajokull glacier because there are so many active volcanoes under the glacier. The dike was propagating from Bardarbunga to the north, in the direction of Askja. We installed seismometers on the tip of the dike and to the sides of it to try to understand how it was moving and to see how deep down it is. We have experienced some earthquakes where we’re staying. One was M4.5 just a few kilometers from the hut, a tiny bit scary. So we have had both earthquakes and eruptions! Exciting times. Eos: What effect will this eruption have on your research? Agustsdottir: I will be working on this data along with my group and my supervisor. The data on the propagating dike and the eruption will at least be a massive chunk of my Ph.D. It might end up being my whole Ph.D.—we’ll just have to see. I am very excited about this unique data set. When I started my Ph.D. last year my aim was to study the seismicity in Vatnajokull due to the many active volcanoes, but now I might focus on one: Bardarbunga. Being able to do science in such a beautiful area and being so lucky to have some volcanic activity going on in your research area is just incredible. It’s the experience of a lifetime. I got into Cambridge, and then this happened. Two big surprises in one year. It is a real thrill. Eos: What’s been the most exciting thing about being on the volcano? Agustsdottir: The most fun is to see an eruption. You’re so small in comparison. It’s so beautiful, powerful, and incredible. That’s the most fun part—to see an eruption and a lava flow. And then knowing that you have this seismic network that is recording all the data so we can actually study it—that is just amazing. 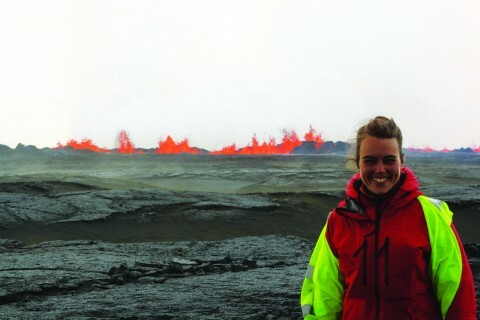 To find out more about Agustsdottir’s experience, see AGU’s Geospace blog or follow her on Twitter at @­fencingtobba.